I am an assistant professor of Computer Engineering at the University of Napoli Federico II, Italy and the CEO of a startup called NM2. 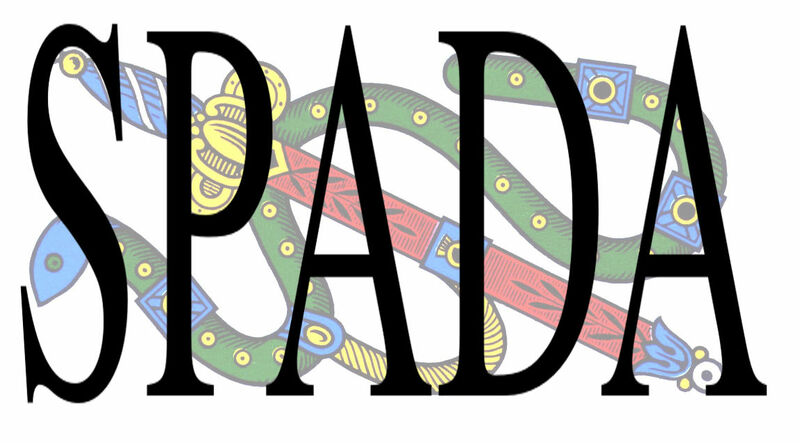 For my teaching activities, please refer to this other site (mostly in Italian). Details on my publications are also available on my Google Scholar profile as well as on DBLP. I am an assistant professor (fixed term or RTD-A as we call it in Italy) at the Department of Electrical Engineering and Information Technlogies of the University of Napoli Federico II, Italy. 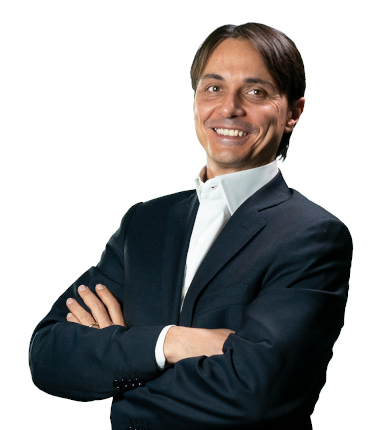 I am also CEO and co-founder of NM2 a startup, spinoff of the University of Napoli Federico II, developing innovative products and services in the area of network monitoring. I graduated in Telecommunications Engineering and obtained a PhD in Computer Engineering at the University of Napoli Federico II, Italy. I am member of the research group called Traffic, working in the area of computer networks and multimedia and part of the larger COMICS, a research group on networking headed by Prof. Giorgio Ventre. I am also member of the CINI-Item research consortium. From February to August 2009 I have been at Eurecom Institute in Sophia Antipois (FR) as a visiting scientist under the guidance of Prof. Ernst Biersack. My research interests fall in the area of computer networks, and, in particular, of their performance measurement and improvement. I am currently working on Cloud Computing and Cloud Robotics, Software Defined Networks, and network security.. These are some of the projects I am or have been working on. 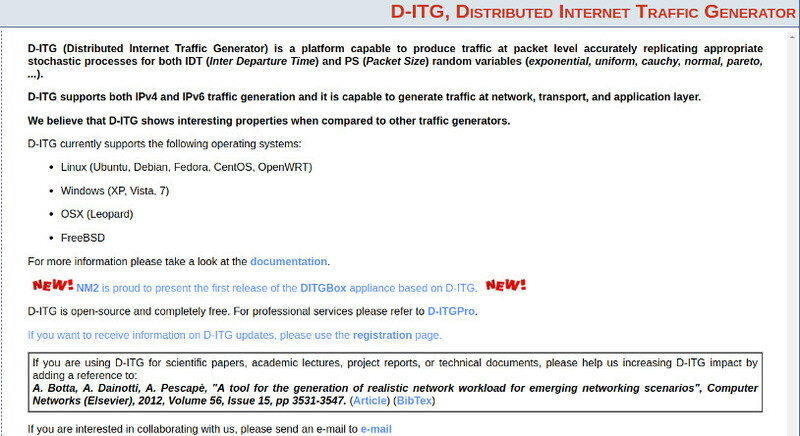 A traffic generator and performance measurement tool. Unified Architecture for Network Measurement. 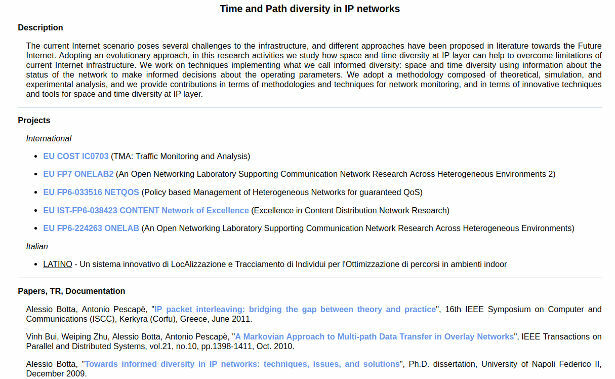 Time and Path diversity in IP networks. A hybrid software tool for network level topology discovery. Giuseppe Aceto, Alessio Botta, Pietro Marchetta, Valerio Persico, Antonio Pescapè "A Comprehensive Survey on Internet Outages", Journal of Network and Computer Applications, Elsevier, vol. 113, pp. 36-63, July 2018. Alessio Botta, Aniello Avallone, Mauro Garofalo, Giorgio Ventre, "A user-oriented performance comparison of video hosting services", Computer Communications, Elsevier, Volume 116, January 2018, Pages 118-131. Pèter Megyesi, Alessio Botta, Giuseppe Aceto, Antonio Pescapè, Sàndor Molnàr, "Challenges and solution for measuring available bandwidth in software defined networks", Computer Communications, Elsevier, Volume 99, 1 February 2017, Pages 48-61. Pietro Marchetta, Valerio Persico, Giuseppe Aceto, Alessio Botta, Antonio Pescapè, "Measuring Networks using IP Options", IEEE Network, Volume 31, Issue 3, 15 February 2017. Valerio Persico, Alessio Botta, Pietro Marchetta, Antonio Montieri, Antonio Pescapè, "On the performance of the wide-area networks interconnecting public-cloud datacenters around the globe", Computer Networks, Elsevier, Volume 112, p. 67-83, January 2017, ISSN: 1389-1286. Alessio Botta, Walter de Donato, Valerio Persico, Antonio Pescapè, "Integration of Cloud Computing and Internet of Things: a Survey", Future Generation Computer Systems, Elsevier, Volume 56, March 2016, Pages 684-700. Valerio Persico, Pietro Marchetta, Alessio Botta, Antonio Pescapè, "Measuring Network Throughput in the Cloud: the case of Amazon EC2", Computer Networks, Elsevier, Volume 93, Part 3, 24 December 2015, Pages 408-422. Alessio Botta, Antonio Pescapè, "IP packet interleaving for UDP bursty losses", Journal of Systems and Software, Elsevier, Volume 109, pp.177-191, November 2015. Leopoldo Angrisani, Alessio Botta, Gianfranco Miele, Antonio Pescapè, Michele Vadursi, "Experiment-Driven Modeling of Open-Source Internet Traffic Generators", IEEE Transaction on Instrumentation and Measurement, Volume 63, no. 11, pp.2529-2538, September 2014. Alessio Botta, Antonio Pescapè, "On the performance of new generation satellite broadband internet services", IEEE Communications Magazine, Volume 52, no.6, pp.202-209, June 2014. Giuseppe Aceto, Alessio Botta, Walter de Donato, Antonio Pescapè, "Cloud monitoring: A survey", Computer Networks, Elsevier, Volume 57, Issue 9, 19 June 2013, Pages 2093-2115. Giuseppe Aceto, Alessio Botta, Antonio Pescapè, Cedric Westphal, "Efficient Storage and Processing of High-Volume Network Monitoring Data", IEEE Transactions on Network and Service Management, vol.10, no.2, pp.162,175, June 2013. Giuseppe Aceto, Alessio Botta, Walter de Donato, Antonio Pescapè, "D-ITG: Distributed Internet Traffic Generator ", Praxis der Informationsverarbeitung und Kommunikation. Volume 36, Issue 1, Pages 49-49, ISSN (Online) 1865-8342, ISSN (Print) 0930-5157. Alessio Botta, Alberto Dainotti, Antonio Pescapè, "A tool for the generation of realistic network workload for emerging networking scenarios", Computer Networks, Elsevier, Volume 56, Issue 15, 15 October 2012, Pages 3531-3547. Giuseppe Aceto, Alessio Botta, Antonio Pescapè, Maurizio D'Arienzo, "Unified Architecture for Network Measurement: the case of available bandwidth", Journal of Network and Computer Applications, Elsevier, Volume 35, Issue 5, September 2012, Pages 1402-1414. Alessio Botta, Antonio Pescapè, Claudio Guerrini, Marin Mangri, "A customer service assurance platform for mobile broadband networks", IEEE Communications Magazine, vol.49, no.10, pp.101-109, Oct. 2011. Alessio Botta, Roberto Canonico, Giovanni Di Stasi, Antonio Pescapè, Giorgio Ventre, Serge Fdida, "Integration of 3G Connectivity in PlanetLab Europe", ACM/Springer Mobile Networks and Applications, Volume 15, Issue 3, June 2010, Pages 344-355. Vinh Bui, Weiping Zhu, Alessio Botta, Antonio Pescapè, "A Markovian Approach to Multi-path Data Transfer in Overlay Networks", IEEE Transactions on Parallel and Distributed Systems, vol.21, no.10, pp.1398-1411, Oct. 2010. Alessio Botta, Alberto Dainotti, Antonio Pescapè, "Do You Trust Your Software-based Traffic Generator? ", IEEE Communications Magazine, vol.48, no.9, pp.158-165, Sept. 2010. Alessio Botta, Antonio Pescapè, Giorgio Ventre, "An approach to the identification of network elements composing heterogeneous end-to-end paths", Computer Networks, Elsevier, Volume 52, Issue 15, 23 October 2008, Pages 2975-2987. Roger P. Karrer, Alessio Botta, Antonio Pescapè, "High-speed backhaul networks: Myth or reality ? ", Computer Communications, Elsevier, Volume 31, Issue 8, 25 May 2008, pp. 1540-1550. Alessio Botta, Antonio Pescapè, Giorgio Ventre, "Quality of Service Statistics over Heterogeneous Networks: Analysis and Applications", EJOR, Elsevier, special Issue on Performance Evaluation of QoS-aware Heterogeneous Systems, Volume 191, Issue 3, 16 December 2008, Pages 1075-1088. Alessio Botta, Donato Emma, Antonio Pescapè, Giorgio Ventre, "Systematic Performance Modeling and Characterization of Heterogeneous IP Networks", Journal of Computer and System Sciences, Elsevier, Volume 72, Issue 7, Performance modelling and evaluation of computer systems, November 2006, Pages 1134-1143. Alessio Botta, Alan Davy, Brian Meskill, Giuseppe Aceto, "Active Techniques for Available Bandwidth Estimation: Comparison and Application", in E. Biersack, C. Callegari, M. Matijasevic, "DATA TRAFFIC MONITORING AND ANALYSIS: From Measurement, Classification and Anomaly Detection to Quality of Experience", LNCS 7754, Springer, Heidelberg (2013). Alessio Botta, et al., "Putting it all together: Using the ArtDeco approach in the wine business domain", in G. Anastasi, E. Bellini, E. Di Nitto, C. Ghezzi, L. Tanca, E. Zimeo, "Methodologies and Technologies for Networked Enterprises", LNCS 7200, Springer, (2013). Alessio Botta, Antonio Pescapè, Roger Karrer, "Wireless Networks Test-beds: when heterogeneity plays with us", in "Heterogeneous Wireless Access Networks, Architectures and Protocols", Springer, 2009, ISBN: 978-0-387-09776-3. Alessio Botta, Luigi Gallo, Giorgio Ventre, "Cloud, Fog, and Dew Robotics: architectures for next generation applications", The Seventh IEEE International Conference on Mobile Cloud Computing, Services, and Engineering (IEEE Mobile Cloud 2019), April 2019, San Francisco East Bay, California, USA. Simona Esposito, Alessio Botta, Melania De Falco, Iunio Iervolino, Antonio Pescapè, Antonio Santo, "Seismic Risk Analysis of Data Communication Networks: a Feasibility Study", 16ECEE, 16th Conference on Earthquake Engineeering, June 2018, Thessaloniki, Greece. Alessio Botta, Jonathan Cacace, Vincenzo Lippiello, Bruno Siciliano, Giorgio Ventre, "Networking for Cloud Robotics: a case study based on the Sherpa Project", International Conference on Cloud and Robotics ICCR2017, November 22-23, 2017, Saint Quentin, France. Valerio Persico, Alessio Botta, Antonio Montieri, Antonio Pescapè, "A First Look at Public-cloud Inter-datacenter Network Performance", IEEE Global Communication Conference (IEEE GLOBECOM 2016), December 4-8, 2016, Washington, DC, USA. Peter Megyesi, Alessio Botta, Giuseppe Aceto, Antonio Pescapè, and Sandor Molnar, "Available Bandwidth Measurement in Software Defined Networks", ACM SAC 2016, NET - Networking Track, Pisa (Italy) 2016. Alessio Botta, Aniello Avallone, Mauro Garofalo, and Giorgio Ventre, "Internet streaming and network neutrality: comparing the performance of video hosting services", International Conference on Information Systems Security and Privacy, Rome (Italy) 2016. Valerio Persico, Pietro Marchetta, Alessio Botta, Antonio Pescapè, "On Network Throughput Variability in Microsoft Azure Cloud", IEEE Global Communication Conference (IEEE GLOBECOM 2015), December 6-10, 2015, San Diego, CA, USA. Giuseppe Aceto, Alessio Botta, Antonio Pescapè, Nick Feamster, Faheem Awan, Tahir Ahmad, Saad Qaisar, "Monitoring Internet Censorship with UBICA", 7th International Workshop on Traffic Monitoring and Analysis (TMA'15) Barcelona (Spain), April 2015. Alessio Botta, Walter de Donato, Valerio Persico, Antonio Pescapè, "On the Integration of Cloud Computing and Internet of Things", The 2nd International Conference on Future Internet of Things and Cloud (FiCloud-2014), August 2014, Barcellona, Spain. Walter de Donato, Alessio Botta, Antonio Pescapè, "HoBBIT: a Platform for Monitoring Broadband Performance from the User Network" Sixth International Workshop on Traffic Monitoring and Analysis (TMA), April 2014, London, UK. Pietro Marchetta, Alessio Botta, Ethan Katz-Bassett, Antonio Pescapè, "Dissecting Round Trip Time on the Slow Path Using a One-Packet Approach", Passive and Active Measurement (PAM) 2014, March, Los Angeles, USA. Leopoldo Angrisani, Alessio Botta, Gianfranco Miele, Michele Vadursi"An experimental characterization of the internal generation cycle of an open-source software traffic generator", IEEE International Workshop on Measurements & Networking (M&N 2013), Napoli, Italy, October 2013. Alessio Botta, Antonio Pescapè, "New generation satellite broadband Internet services: should ADSL and 3G worry? ", 5th IEEE International Traffic Monitoring and Analysis Workshop (TMA 2013), co-located with IEEE INFOCOM 2013, April 2013, Torino, Italy. Giuseppe Aceto, Alessio Botta, Walter de Donato, Antonio Pescapè, "Cloud Monitoring: definitions, issues and future directions", 1st IEEE International Conference on Cloud Networking (IEEE CloudNet'12)", Paris (France), NOVEMBER 28-30, 2012. Giuseppe Aceto, Alessio Botta, Walter de Donato, Pietro Marchetta, Antonio Pescapè, Giorgio Ventre, "Open Source Platforms for Internet Monitoring and Measurement", 2012 IEEE Eighth International Conference on Signal Image Technology and Internet Based Systems (SITIS 2012), 25-29, November 2012, Sorrento (Napoli), Italy. Giuseppe Aceto, Alessio Botta, Antonio Pescapè, Cedric Westphal "An efficient storage technique for network monitoring data", IEEE International Workshop on Measurements & Networking (M&N 2011), Capri, Italy, October 2011. Alessio Botta, Antonio Pescapè, "IP packet interleaving: bridging the gap between theory and practice", 16th IEEE Symposium on Computer and Communications (ISCC), Kerkyra (Corfu), Greece, June 2011. Alessio Botta, Antonio Pescapè, "Monitoring and measuring wireless network performance in the presence of middleboxes", The 8th International Conference on Wireless On-demand Network Systems and Services (WONS), Bardonecchia (Torino), Italy, January 2011. (Download the poster). Alessio Botta, Antonio Pescapè, Giuseppe Aceto, Maurizio D'Arienzo, "UANM: a platform for experimenting with available bandwidth estimation tools", 15th IEEE Symposium on Computer and Communications (ISCC), Riccione, Italy, June 2010. (Best paper award - local category). Alessio Botta, Antonio Pescapè, Giorgio Ventre, Ernst Biersack, Stefan Rugel, "Performance footprints of heavy-users in 3G networks via empirical measurement", 6th International workshop on Wireless Network Measurements (Winmee) 2010, Avignon, France, May 2010. Alessio Botta, Roberto Canonico, Giovanni Di Stasi, Antonio Pescapè, Giorgio Ventre, "Providing UMTS connectivity to PlanetLab nodes", 3rd International Workshop on Real Overlays & Distributed Systems, collocated with ACM CoNEXT 2008, Madrid, Spain, 9 - 12 December, 2008. Alessio Botta, Walter de Donato, Antonio Pescapè, Giorgio Ventre, "Networked Embedded Systems: a Quantitative Performance Comparison", IEEE Globecom 2008, New Orleans (LA), USA, 30 November - 4 December, 2008. Vinh Bui, Weiping Zhu, Alessio Botta, Antonio Pescapè, "An MDP-based Approach for Multipath Data Transmission over Wireless Networks", IEEE International Conference on Communications (ICC), Beijing, China, 19 - 23 May 2008. Alessio Botta, Walter de Donato, Antonio Pescapè, Giorgio Ventre, "Discovering Topologies at Router Level: Part II", IEEE Globecom 2007, Washington D.C., 26-30 November, 2007. Alessio Botta, Antonio Pescapè, Giorgio Ventre, Roger P. Karrer, "High-speed wireless backbones: measurements from MagNets", Fourth IEEE International Conference on Broadband Communications, Networks, and Systems (Broadnets), Raileigh, North Carolina (USA), 10 - 14 September 2007. Vinh Bui, Weiping Zhu, Antonio Pescapè, Alessio Botta, "Long Horizon End-to-End Delay Forecasts: A Multi-Step-Ahead Hybrid Approach", IEEE International Symposium on Computers and Communications (ISCC), Aviero, Portugal, 1 - 4 July 2007. Roger P. Karrer, Istvan Matyasovszki, Alessio Botta, Antonio Pescapè, "MagNets - experiences from deploying a joint research-operational next-generation wireless access network testbed", International Conference on Testbeds and Research Infrastructures for the Development of Networks and Communities (TRIDENTCOM), Orlando, Florida (USA), 21 - 23 May 2007. Alessio Botta, Alberto Dainotti, Antonio Pescapè, Giorgio Ventre, "Reducing Network Traffic Data Sets", IEEE International Conference on Communications (ICC), Glasgow, Scotland, 24 - 28 June 2007. Alessio Botta, Antonio Pescapè, Giorgio Ventre, "Identification of Network Bricks in Heterogeneous Scenarios", First IEEE LCN Workshop on Network Measurements,Tampa, Florida, 14 - 17 November 2006. Roger Karrer, Istvan Matyasovszki, Alessio Botta, Antonio Pescapè, "Experimental Evaluation and Characterization of the Magnets Wireless Backbone", 1st ACM MobiCom 2006 International Workshop on Wireless Network Testbeds, Experimental evaluation and CHaracterization (WiNTECH 2006), Los Angeles, California (USA), 29 September 2006. Alessio Botta, Antonio Pescapè, Giorgio Ventre, "On the Statistics of QoS Parameters over Heterogeneous Networks", IFIP Networking 2006 Workshop Towards the QoS Internet (To-QoS'2006), Coimbra, Portugal, 15 - 19 May 2006. Leopoldo Angrisani, Alessio Botta, Antonio Pescapè, Michele Vadursi, "Measuring Wireless Links Capacity", IEEE International Symposium on Wireless Pervasive Computing 2006, Puket, Thailand, 16 - 18 January 2006. (An extended version of this aricle is present in a Special Issue of Journal of Computer and System Sciences). Alessio Botta, Salvatore D'Antonio, Antonio Pescapè, Giorgio Ventre, "BET: A Hybrid Bandwidth Estimation Tool", IEEE Workshop on Performance Modeling and Analysis of Communication in Parallel, Distributed, and Grid Networks (PMAC-PDG'05), Fukuoka, Japan, 20 - 22 July 2005. Antonia Affinito, Alessio Botta, Luigi Gallo, Mauro Garofalo, Giorgio Ventre, "SPADA: SPark Anomaly Detection Ace", ACM Conext 2018 Poster Session, Heraklion/Crete, Greece, December 2018. Alessio Botta, Alberto Dainotti, and Antonio Pescapè, "Do you know what you are generating? ", ACM Conext 2007 Student Workshop, New York (USA), December 2007. Alessio Botta, Alberto Dainotti, Antonio Pescapè, Giorgio Ventre, "Searching for invariants in network games traffic", ACM Conext 2006 Student Workshop, Lisbon, December 2006. Alessio Botta, Ernst Biersack, Antonio Pescapè ,"New generation cellular networks: performance measures from an operational deployment", (TR-DIS-CEL-9-2009) University of Napoli Federico II (Italy) and Eurecom (France), September 2009. Alessio Botta, Antonio Pescapè ,"Packet interleaving from theory to practice", (TR-DIS-INT-7-2009) Dipartimento di Informatica e Sistemistica, University of Napoli Federico II, July 2009. Alessio Botta, Walter De Donato, Antonio Pescapè, Giorgio Ventre " Design, Implementation, and Testing of a Hybrid Tool for Network Topoly Discovery", (TR-DIS-TD-3-2007) Dipartimento di Informatica e Sistemistica, University of Napoli Federico II, March 2007. Alessio Botta, Antonio Pescapè, "How to set up and configure StarEast in Access Point Mode with Intel 2200 Wireless Network Interfaces ", (TR-DIS-NP-2-2007) Dipartimento di Informatica e Sistemistica, University of Napoli Federico II, February 2007. Alessio Botta, Istvan Matyasovszki, Antonio Pescapè, Roger Karrer, "Results of the Experimentation of Magnets Wireless Backbone", (TR-DTLab-UoN-2006) University of Napoli Federico II (Italy) and Deutsche Telekom Laboratories, TU Berlin (Germany), June 2006. Alessio Botta, Donato Emma, Salvatore Guadagno, and Antonio Pescapè, "Performance Evaluation of Heterogeneous Network Scenarios", (TR-DIS-102004) Dipartimento di Informatica e Sistemistica, University of Napoli Federico II, October 2004. 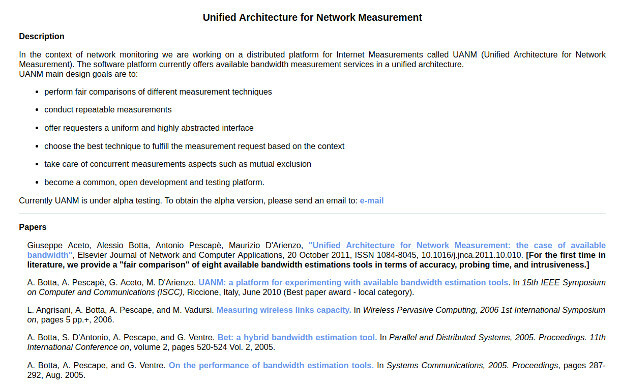 Antonio Pescapè, Alberto Dainotti, Alessio Botta, "On Internet Measurement Research", 1st Newsletter of the IEEE Technical Committee on Communication Systems Integration and Modeling, November 2006. Alessio Botta, Alberto Dainotti, Antonio Pescapè, "Multi-protocol and multi-platform traffic generation and measurement", IEEE INFOCOM 2007 DEMO Session, May 2007, Anchorage (Alaska, USA). Internal or personal use of this material is permitted. However, permission to reprint/republish this material for advertising or promotional purposes or for creating new collective works for resale or redistribution to servers or lists, or to reuse any copyrighted component of this work in other works, must be obtained from the IEEE, ACM, Elsevier or the other copyright holders. International Journal of Communication Networks and Information Security (IJCNIS). Journal of Mobile and Ubiquitous Computing Technology. TPC Co-Chair of IEEE Mobile Cloud 2019. Co-Chair of IEEE Global Communications Conference (IEEE Globecom) 2019 - Next Generation Networking and Internet Symposium. Co-Chair of Traffic Monitoring and Analysis workshop (TMA) 2016. Performance Evaluation and Modelling track of the 2nd International Conference on the Future Internet of Things and Cloud (FiCloud 2014). ACM International Workshop on Wireless and Mobile Technologies for Smart Cities (WiMobCity), in conjunction with ACM International Symposium on Mobile Ad Hoc Networking and Computing (MobiHoc 2014). 2nd IEEE Workshop on Traffic Identification and Classification for Advanced Network Services and Scenarios (TRICANS 2014). ICC 2014 Workshop. International Conference on Computing, Networking and Communications (ICNC 2014), Symposium on Communication QoS and System Modeling. 1st Workshop on High Performance and Programmable Networking 2013 (HPPN'13), in conjunction with the 22nd International ACM Symposium on High-Performance Parallel and Distributed Computing (HPDC'13). 1st IEEE Workshop on Traffic Identification and Classification for Advanced Network Services and Scenarios (TRICANS 2013). ICC 2013 Workshop. International Conference on Computing, Networking and Communications (ICNC 2013), Symposium on Communication QoS and System Modeling. International Conference on Communications in Computing 2006. IEEE International Conference on Communications (ICC), Symposium on Next-Generation Networking and Internet, years 2018, 2017, 2016, 2015, 2014, 2013, 2012. IEEE International Conference on Communications (ICC), Selected Areas in Communications, years 2017, 2016. 2016 IEEE Global Communications Conference (Globecom), Next Generation Networking and Internet, years 2018, 2017, 2016, 2015, 2013, 2012. 2016 IEEE Global Communications Conference (Globecom), Selected Areas in Communications, years 2016, 2015. The Fifth IEEE International Workshop on Cloud Computing Systems, Networks, and Applications (CCSNA) 2016, A Globecom 2016 workshop. International Conference on Computing, Networking and Communications (ICNC), Symposium on Communication QoS and System Modeling, years 2018, 2017, 2016, 2015, 2014, 2013.
International Conference on Computing, Networking and Communications (ICNC), Symposium on Multimedia Computing and Communications, year 2016. Software Defined Networking & Network Functions Virtualisation Summit 2015. Third Workshop on Cloud Computing Systems, Networks, and Applications (CCSNA), in conjunction with IEEE ICC 2015. ITU Kaleidoscope conference, years 2015, 2014.
International Workshop on Smart Cities and Urban Informatics in conjunction with IEEE INFOCOM 2015.
International Conference on Advances in Computing, Communications and Informatics (ICACCI), years 2015, 2014. IEEE/CIC International Conference on Communications in China (ICCC 2015) Next Generation Networking. Fifth IEEE International Conference on Communication Systems and Network Technologies (CSNT-2015). IEEE International Conference on Signal Processing, Informatics, Communication and Energy Systems (IEEE SPICES). 2015 International Conference on High-Performance Compilation, Computing, and Communications (HP3C 2015). Global Summit on Computer & Information Technologies 2015. 2nd IEEE Workshop on Traffic Identification and Classification for Advanced Network Services and Scenarios (TRICANS 2014), an ICC 2014 Workshop. IEEE Globecom 2014 Workshop on Cloud Computing Systems, Networks, and Applications (CCSNA). The 3rd International Conference on Connected Vehicles & Expo (ICCVE 2014). 2014 International Workshop on Mobile Applications (MobiApps 2014). 2014 International Workshop on the Design and Performance of Networks on Chip (DPNoC 2014). 2014 International Conference on Internet of Vehicles. International Conference on Cloud Computing and Secure Networking (ICCSN 2014). 11th IFIP International Conference on Network and Parallel Computing (NPC 2014). The 4th International Symposium on Cloud and Services Computing (SC2 2014). International Conference on Computer Technology Applications (ICCTA 2014). International Conference on Advances in Computing, Communications and Informatics (ICACCI-2014). International Conference on Communication Systems and Network Technologies 2014 (CSNT 2014). 8th International Symposium on Security and Multimodality in Pervasive Environment (SMPE 2014), in conjunction with AINA 2014.
International Symposium on Theory of Computing, and Global Computing Models (TCGC-2014). 2014 International Conference on Electronic Publishing and Information Technology (ICEPIT 2014). 2014 International Summit on Bio-Metrics and Smart Government (IBMSGS 2014). International Conference on Connected Vehicles & Expo (ICCVE 2013). The International Workshop on the Future Internet of Things and Cloud (FiCloud), in conjunction with the 10th International Conference on Mobile Web Information Systems (MobiWIS 2013). 1st IEEE Workshop on Traffic Identification and Classification for Advanced Network Services and Scenarios (TRICANS 2013), an ICC 2013 Workshop. The 11th IEEE/IFIP International Conference on Embedded and Ubiquitous Computing (EUC-13), Agents and Distributed Computing Track. 2013 IEEE Global Communications Conference (Globecom 2013), Communications QoS, Reliabiliity and Modelling. 7th International Symposium on Security and Multimodality in Pervasive Environment (SMPE 2013), in conjunction with AINA 2013.
International Conference on Consumer Electronics, Communications and Networks (CECNet 2013). 2012 IEEE Global Communications Conference (Globecom 2012), Communications QoS, Reliability and Modelling Symposium. 4th Traffic Monitoring and Analysis Workshop (TMA 2012), co-located with the Passive and Active Measurement Conference 2012. The first annual International Conference on Connected Vehicles & Expo (ICCVE 2012). 6th International Symposium on Security and Multimodality in Pervasive Environment (SMPE 2012), in conjunction with AINA 2012. 2011 International Conference on Communications and Mobile Computing (CMC 2011). 5th International Symposium on Security and Multimodality in Pervasive Environment (SMPE 2011), in conjunction with AINA 2011. The Second International Workshop on Design, Optimization and Management of Heterogeneous Networked Systems (DOM-HetNetS'10), in conjuction with 39th International Conference on Parallel Processing. 4th International Symposium on Security and Multimodality in Pervasive Environment (SMPE 2010), in conjunction with AINA 2010. 2010 International Conference on Communications and Mobile Computing (CMC 2010). 3rd International Symposium on Security and Multimodality in Pervasive Environment (SMPE 2009), in conjunction with AINA 2009. 2009 International Conference on Communications and Mobile Computing (CMC 2009). The 2007 International Workshop on Secure and Multimodal Pervasive Environments. Last update mar 18, 2019.